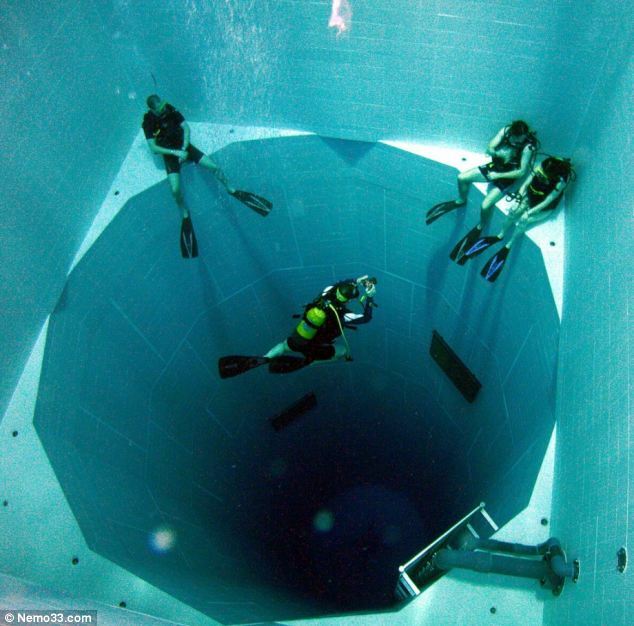 Located in Brussels in Belgium, Nemo 33, the world’s deepest swimming pool, contains a whopping 660,500 gallons (2.5 million litres) of non-chlorinated, highly filtered spring water that is kept at a temperature of 30C (86F). Swimmers wanting to fetch something off the bottom of this pool will certainly need more than a lungful of air – seeing as it’s a staggering 113 feet (34.5 metres) deep. It takes the phrase “being thrown in at the deep end” to a whole new level. The pool consists of a submerged structure with flat platforms at various depths and has two large flat-bottomed areas at depth levels of 16feet (5 metres) and 33 feet (10 metres), and a large circular pit that has a depth of 108 feet (33 metres). It also holds several underwater caves at 10 metres deep. The venue, with its simulated underwater caves, varying depths and constant toasty temperatures, is the perfect place for both novice and more experienced divers. And for those divers and instructors that need more time at the bottom, there are three pressurized rooms at -30 (-10 metres) and -23 metres (-7 metres) with constantly renewed air. Nemo 33 was designed by Belgian diving expert John Beernaerts as a multi-purpose diving instruction, recreational and film production facility. Meanwhile, for those that don’t want to take a dip, there are fourteen underwater windows that allow outside visitors to view all the underwater action. Is it legal to hide in an embassy?